The experts at AllenComm solve business problems with beautiful custom learning solutions. We bring creativity into instructional design. We change behaviors and influence choices. We build better training. 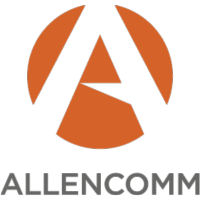 AllenComm is a leading custom training solutions provider that partners with the nation’s top brands to create unique and innovative learning solutions that make an impact. Using extensive instructional design experience, innovative learning technologies, and agency-level creative teams, in combination with a design and development system empowers AllenComm to gain a thorough understanding of clients and their learner’s needs and objectives. AllenComm uses a performance acceleration platform to incorporate the most innovative elearning techniques to meet the most challenging training objectives that allow AllenComm clients to scale for growth. AllenComm explores and utilizes the best methodologies for their clients such as microlearning, gamification, blended learning, motion graphics, AR/VR, and more. See award-winning AllenComm learning solutions in onboarding, brand, compliance, and sales enablement training at www.allencomm.com. Discover the Solutions AllenComm has to offer. Read reviews and discover other eLearning Industry community members's experience with AllenComm.